Serious Case of the Runs: Still No Stank! Winter running, it ain't so bad. So long as you're prepared and dressed smartly, you're sure to have a grand old time. Anywho! I've been having fun squaring away the final miles of 2010 (I finally surpassed 2009's miles, woohoo! Final number to be revealed soon...) and getting in some much needed snow running. I had forgotten how much I really do enjoy running through the snow. Snow makes everything pretty. Sunday, we decided it was time for another run after taking a couple days off. We were back home, and headed onto the path for a solid 8 miles. Unbeknownst to us, the path hadn't been plowed yet, so we were treated to a thick, fluffy layer of snow the whole way; sweet! 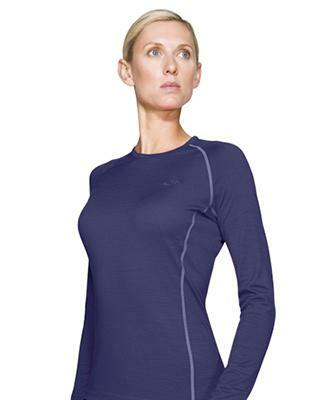 I was testing out the newest addition to my winter running wardrobe, and after a second equally snowy and cold (yet still somehow quite sweaty) 5 mile run on Monday in the same shirt (ewwwwww, groooooooosss), the verdict is in: the Icebreaker Bodyfit 200 long sleeve shirt is the bomb diggity. One run is usually enough to tell what I'm going to think of something, but this time I needed a second opinion. You see, Icebreaker is supposed to, among other things, not be stinky. It's that whole merino wool thing. I seem to be pretty good at stinkifying running shirts, or at least leaving a deodorant scent. Not so in my new threads. I aired it out overnight on the drying rack both times (like I do for all my sweaty running clothes), and the next day the shirt smelled like it did fresh out of the package (which is this really cool slider cardboard box). Hmmm, interesting. Still no stank. Okay, enough of the pitch. I just get so excited when I find really great gear. I've heard good things about Icebreaker, thanks for the confirmation! 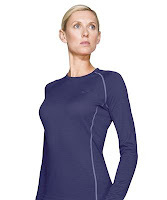 I have a few Smartwool tops, too, but they just don't seem to be as rockin'. They are better for kicking around in with jeans (not running tights:)). Serious Case of the WooHoos!